For the past couple weeks, I've done my best to avoid trying to make a firm prognostication of the near-term as long as the market remained range-bound. 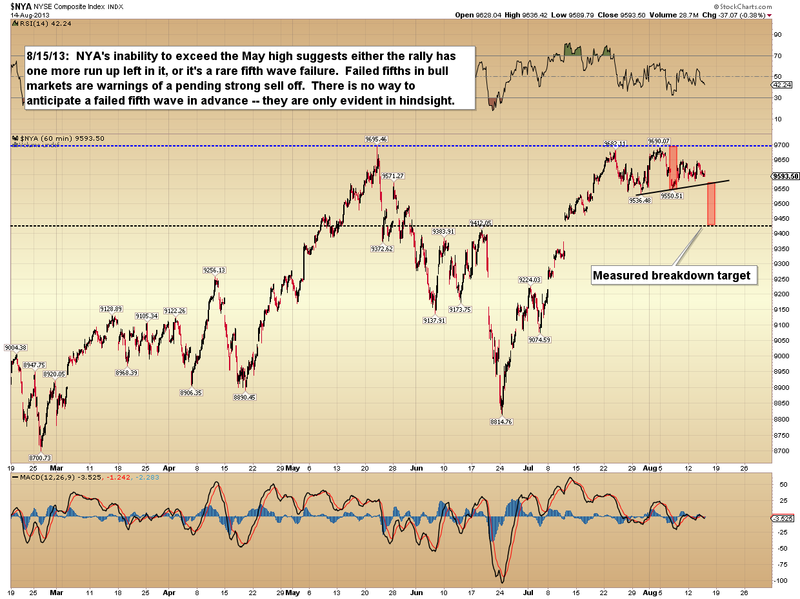 As of this morning, it appears the market is ready to break down from the apparent head and shoulders top. 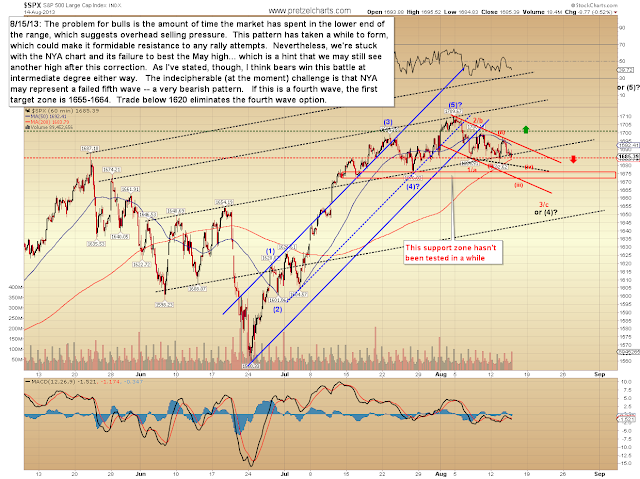 I've made my intermediate bearish stance pretty clear, but we're presented with a lingering conundrum regarding the short term. The NYSE Composite (NYA), which is a fantastic representation of the market as a whole, has thus far failed to best its May high. The purpose of a fifth wave rally is to break the high of the previous wave; and the vast majority of the time, that's exactly what it does. In rare instances, the market will experience something called a "fifth wave failure" -- which, as the name implies, is when the fifth wave fails to exceed the high of the prior wave. Fifth wave failures are impossible to predict in advance -- in fact, their very nature is to be the exception to the rule. 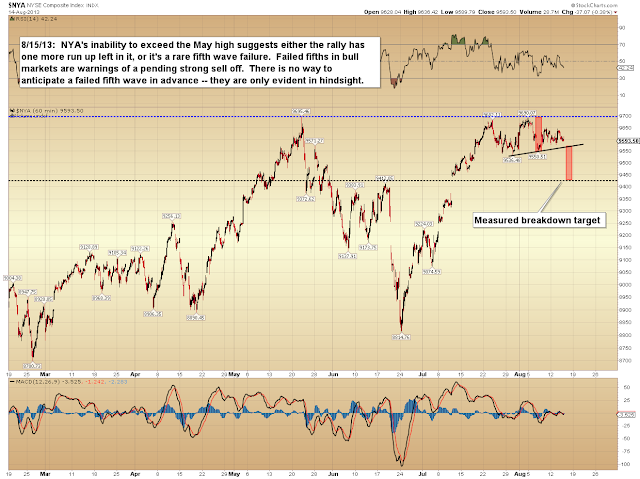 Outside of NYA's failure to make a new high, the patterns in most other markets look bearish. After several weeks of top-building, it's difficult to image we'll see a short-lived breakdown. Everything seems to be lined up for a sustained intermediate breakdown -- except for the lingering doubt created by NYA's failure to make a new high. I obviously can't be certain what will happen here, but because of NYA, I'm going to at least keep an open mind to the possibility that we'll see a relatively short-lived breakdown, then a new high to complete the expectations of wave v -- and then the more serious intermediate bear move. If it weren't for NYA, I'd say fuggedaboutit, bears will run straight to the end zone. Despite NYA, the preponderance of evidence seems to favor the bears for the time being, so that's the direction I"m going to lean. 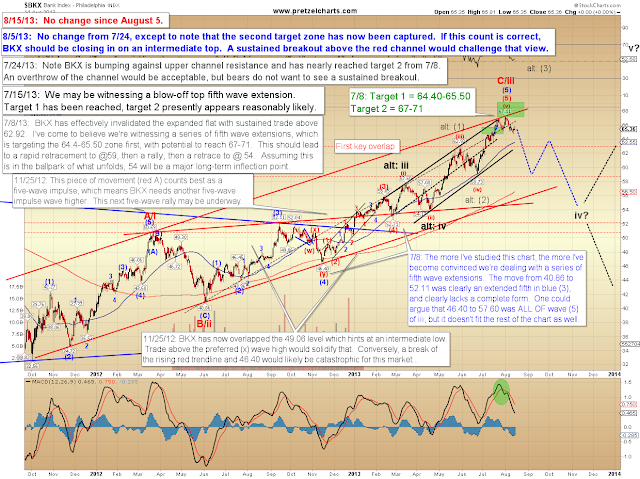 It's entirely possible that NYA did indeed form a failed fifth, which would suggest a very strong bearish market to come. I'll track both options heading forward. 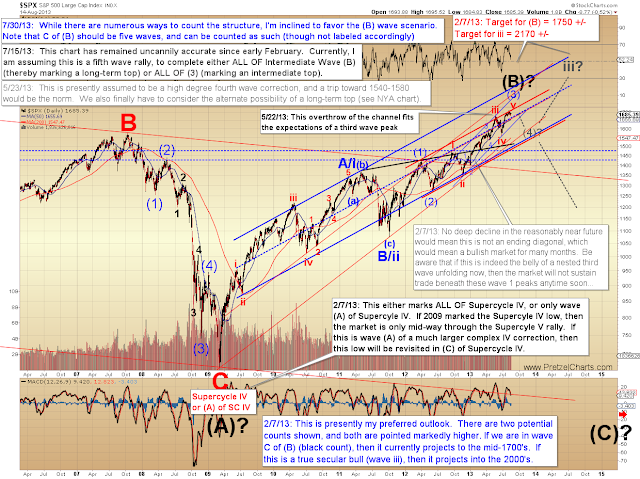 The S&P 500 (SPX) notes the apparent near-term count, and some preliminary targets. In the big picture view, I continue to feel that no matter how the near-term resolves, the bears are about to take control of the intermediate picture. 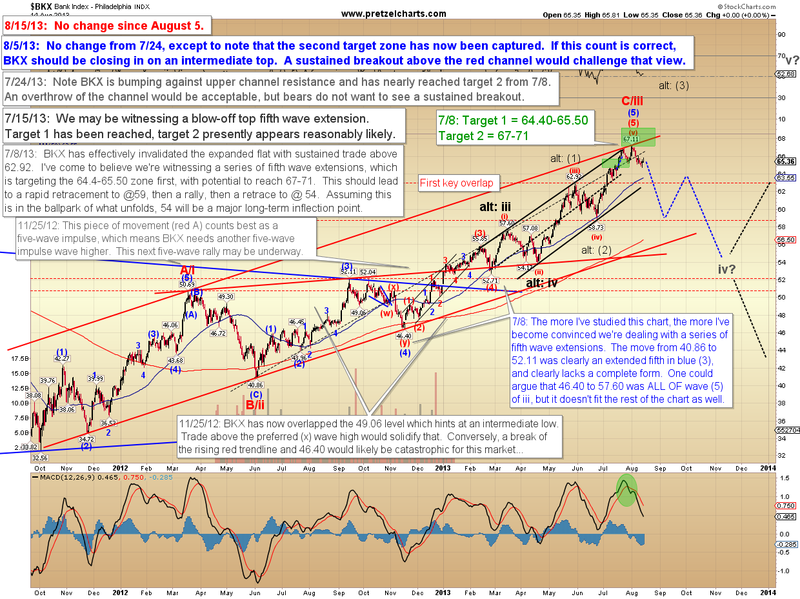 The Philadelphia Bank Index (BKX) reached my final target zone, as previously noted, and may have thus completed its rally and wave structure at Intermediate degree. In conclusion, NYA has left a few unanswered questions on the table, and thus left the near-term a bit vague. Since my expectation has been for an intermediate decline, and so many markets looks toppy, I'll treat NYA as a failed fifth wave for the time being -- but with an open mind toward the possibility that we're simply unraveling a fourth wave correction. Trade safe. Didn't you just tell us yesterday to expect a short term rally to the 1730/1750 level. Maybe you should exercise some more patience. paths it could take to reach that target." 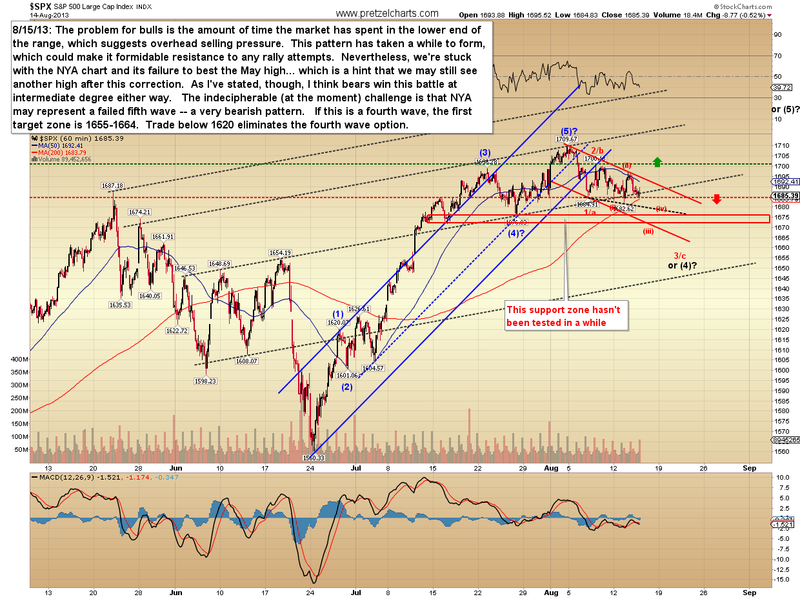 The lower fourth wave target and reversal could still play out -- I genuinely don't know. NYA is a big ??? right now. The problem is it's an outlier, and virtually everything else looks bearish. Pay no attention to that guy, what you do is highly valued by a lot of people, I read your blog every morning! David. No, he did not. Maybe you should exercise a little less confusion. PL: long time lurker and a big fan. Really respect your posts. Keep it up!